In the last few days, we’ve certainly felt that spring is on its way in Yorkshire. From snowdrops in bloom and the first daffodils poking their heads through the soil, to new buds on the trees and constant birdsong around Abbots Green, there are signs of new life everywhere. It’s a wonderful time to be enjoying your holiday home in Yorkshire, as winter fades away and the new year begins in earnest. The days are growing steadily warmer and daylight hours are extending, so here are a few suggestions of perfect ways to enjoy the best of spring in Yorkshire. 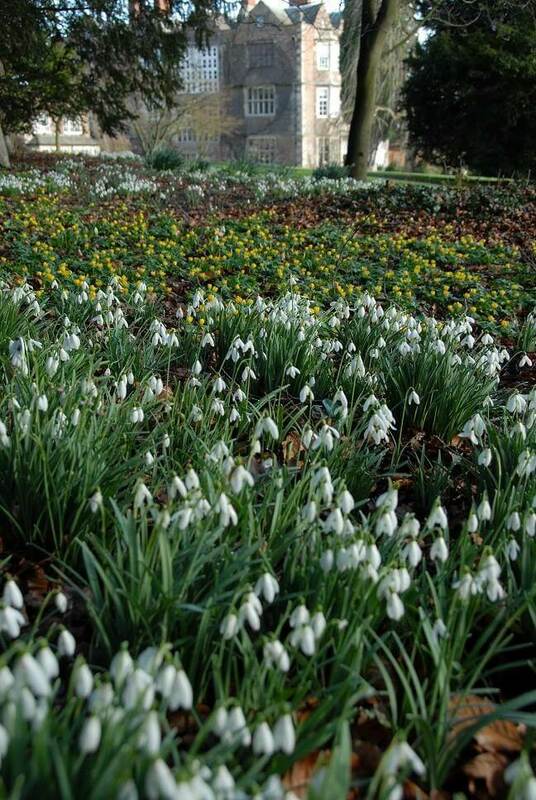 Every February, Goldsborough Hall near Knaresborough opens its doors for Snowdrop Days. Take time to wander through the beautiful grounds and see the carpet of snowdrops between the trees (pictured left by Mark Oglesby). As well as more than 40 varieties of the little white flowers, you’ll find hellebores and winter aconites dotted around the lawns. 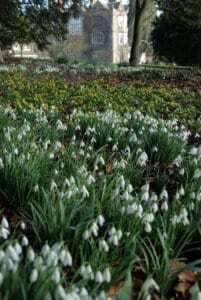 There is just one date remaining for this year’s Snowdrop Days – Sunday 19th February. If you can’t make it, pop a note in your diary to go along on Sunday 2nd April when the National Garden Scheme (NGS) open day will take place. By then, hundreds of spring bulbs will be in bloom, and many other shrubs and plants will be showing themselves off to their full potential. Admission for each of the open days is £5, with lunches and afternoon teas available too (booking advised if you want to enjoy their famous dining experiences). Click here to find out more. Once the bluebells are in bloom, there’s no better place to view them than at Roseberry Topping. This famous landmark is a favourite with walkers, offering stunning views across many miles of beautiful landscape. At this time of year, though, the route up to the top is often just as picturesque. 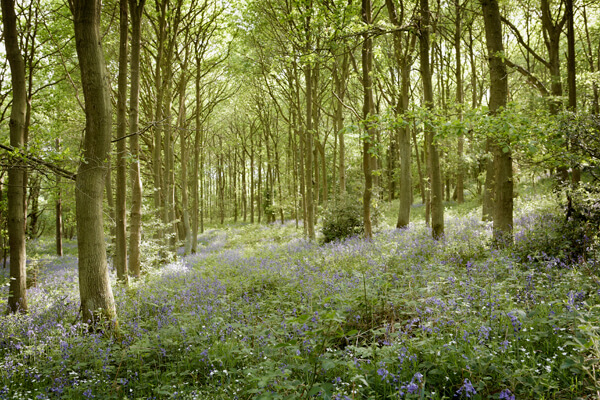 Newton Wood is often carpeted with bluebells for a few weeks in late spring. The bluey-purple haze extends for miles, and is often accompanied by other local wildlife including rabbits, deer and woodpeckers. The National Trust has a suggested trail through the woods and up to Roseberry Topping – click here to find out more. If you prefer your flowers cultivated and your gardens carefully designed, Harrogate Spring Flower Show is for you. This year’s event takes place from 20th to 23rd April, with hundreds of attractions to keep gardeners happy. From show gardens by experienced designers and local charities, to stands filled with all sorts of unusual varieties and clever equipment, there’s plenty to fill a whole day – or even two. And if you would rather be in the kitchen than among the borders, you might enjoy the Kitchen Garden section, sharing top tips for getting the best results with your fruit and veg. As well as standard tickets from £14.50 in advance, there are VIP packages available including hospitality in the President’s Pavilion. Why not make a special day of it? Click here to book. Just over a mile from Abbots Green luxury holiday lodges in North Yorkshire is a wonderful wood with beautiful woodland walks. It’s a favourite with our residents all year round as it’s so close to their holiday lodges, but from mid-April to mid-May, it’s filled with gorgeous bluebells. If you’re on site and fancy going to visit Bluebell Woods, as they’re known locally, just ask one of our team and they’ll be happy to give you directions. Pack up a picnic and don’t forget your camera! Our 15th gold David Bellamy Conservation Award! A true Yorkshire countdown to Christmas!